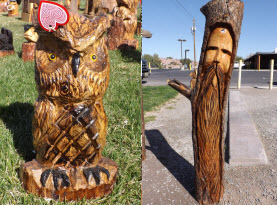 Even in the deserts of Las Vegas, NV resides a brilliant chainsaw carving master. Clark the Carver has been improving his craft for over 30 years and has carved an assortment of carvings out of fallen trees including pine, redwood, ponderosa, and cottonwood. 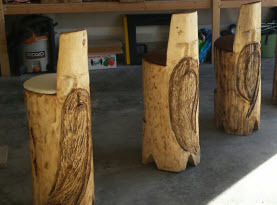 He also can turn an aged old stump blemishing your landscape with a masterpiece carving, which to some folks can eliminate high cost stump removal services and leave with you impressive work of art to add charm to your landscape. 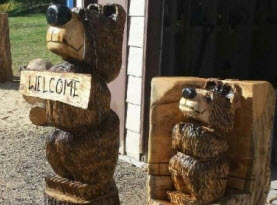 Carving animals, totems, wizards, name boards, welcome signs, furniture and more, Carve Me A Bear! 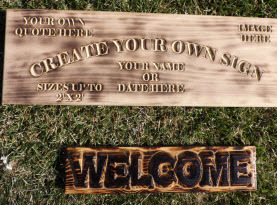 Chainsaw Carvings can custom carve your idea. Among the many animals Clark the Carver creates with his trusty chainsaw are dogs. As most Las Vegas, NV and surrounding areas locals know, we recently had one of metros finest sacrifice his life in the line of duty. Nicky, a Belgian Malinois and a canine officer, who originally made news getting violently assaulted with a machete heroically made a speedy recovery from the ordeal, quickly returning to work. After just a short time back on duty, Nicky was tragically gunned down, a fallen hero who died doing what he loved. In honor of Nicky, a beloved Metro Police Canine Officer killed in the line of duty, was immortalized in Clark the Carver’s chainsaw carving and presented to Nicky’s partner and handler Las Vegas Police Sergeant Eric Kerns. With the ability to carve a multitude of breeds of dogs Carve Me A Bear! Chainsaw Carvings can carve your favorite breed, whether it is for a memorial of a past loved one, or to celebrate the breed of dog you are partial to, we can carve a custom pooch to your liking and incorporate other words or props of sentiment. German Shepherds are a very popular breed through the country, with their natural smarts, strength and loyalty. They are often used in law enforcement and military, along with home security, and bonding love. German Shepherds range from 22”-26” tall and 49-88 pounds. Ranging in colors from tradition black and tan, they also are all white, all black, grey, sable, blue, red and black, black and silver and silver. German shepherds are territorial, loving and adoring to people they know and they will often show distrust in strangers. With proper training and socializing, you can teach them to not be aggressive. Labradors are another fun loving dog that is commonly popular throughout Greater Las Vegas. With friendly, outgoing, even tempered, kind, loyal, trusting dispositions, they are also very agile and active. A perfect pup to join any family, labs coloring are chocolate, black and varying degrees of yellow. Labs are generally between 22” and 24” and are 55-79 pounds. Carve Me A Bear! Chainsaw Carvings can carve the lab with the chainsaw to commemorate the Labrador breed. For a smaller pup, Beagles are relatively popular, ranging from 13”-16” and 20-24 pounds. Beagles are even tempered and gentle, but still display excitement intelligence and determination. They make excellent companions. Carve Me A Bear! Chainsaw Carvings can carve your Beagle friend to add to your home a carved Beagle sculpture. Carve Me A Bear! Chainsaw Carvings can custom create your favorite dog carving with our experience and expertise and talents, Clark the Carver can get it done to add to your Las Vegas, NV and surrounding area home. Contact us today to order your a unique, custom chainsaw carving!